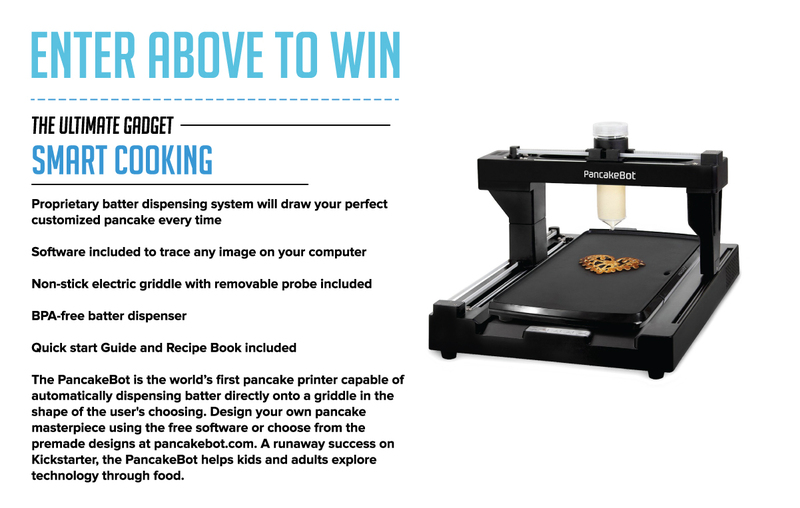 Enter Below To Win Your Own Pancake Printer! Void where prohibited and outside US. Open to [include eligible entrants, e.g., “legal US residents (incl. DC), who are 18+ (19+ in NE and AL; 21+ in MS) at entry”]. Begins [12:00:01 AM ET] on [8-1-16]; ends [11:59:59 PM ET] on [9-16-16]. To enter, To enter just submitted your name and email above.Total ARV of all prizes: $299. Odds of winning depend on number of entries received. For complete rules and eligibility requirements, http://sweepstakes.homemaderecipes.com/rules/rgjnalun. Sponsor: Homemade Recipes Copyright ©2016 Homemade Recipes. Homemade Recipes® and other logos or trademarks listed herein are trademarks of Company, Inc. in the U.S. and other countries. All rights reserved. This promotion is in no way sponsored, endorsed or administered by, or associated with Facebook, Twitter, LinkedIn, Pinterest or Google. You understand that you are providing your information to the owner of this contest and not to Facebook, Twitter, LinkedIn, Pinterest or Google.